Providing you the best range of exercising ball, tourniquet, weight cuff, ortho stockinette 10 mt, hot & cold pack and scrotal support with effective & timely delivery. We are instrumental in offering our clients a comprehensive range of Exercising Ball which is compatible for thermal or hydrotherapy. This exercising ball is checked on numerous parameters in order to supply a defect free range to customers. Our exercising ball is manufactured using high quality material and sophisticated technology in fulfillment with the set industry standards. Besides, the offered exercising ball is flexible and pleasurable exercise plans can be designed to give better compliance. Owing to a modernized infrastructure for trouble-free processing & post-production, we are instrumental in offering Tourniquet. The tourniquet has durable sealing, without clumsy stitching adds to the aesthetics. Offered tourniquet is inspected on varied parameters in order to supply a flawless range. Our vendors manufactured this tourniquet using excellent quality polyamide hook and loop tape & contemporary techniques by vendor’s highly skilled technocrats as per the norms of industry. To meet the diversified requirements of our precious clients, we have been engaged in offering Weight Cuff. Our offered weight cuff can also be used during the normal chores to improve muscle mass, strength, muscle tone and stamina. This weight cuff is examined by quality experts so as to deliver a flawless range at customer’s end. We provide this weight cuff from us within a committed time frame at market price. We take pleasure in introducing ourselves as one of the leading organizations, involved in offering Ortho Stockinette 10 Mt which is comes in easy dispenser packs. This product is well tested on several parameters of quality for ensuring its excellence. Our product is manufactured utilizing the utmost quality high quality long stapled cotton at vendor’s hi-tech manufacturing unit. As well, our product is accessible in numerous sizes according to the demand of patrons. Versatile device to provide both hot and cold compresses with temperature range 4 to 60 degree C. Reusable with a long functional life. Can treat inflammation, muscle spasm, pain, injury and hyper-pyrexia. Non-toxic, biodegradable gel remains soft and flexible on freezing. Plush fabric cover is durable, soft and gentle. The elastic belt makes it "hands free" & body conforming. Anatomic scrotal pouch made from strong stretchable fabric ensures good support & compression. Soft feel ensures comfort without any abrasion, rash or allergy. Extra strong, wide waist band with hook loop tightening ensures good lift without slippage. Pocket for penile separation is an added feature. Adjustable perineum straps help in providing controlled pressure to the scrotum .Well ventilated with pleasing looks. Nylon yarn makes i; comfortable,durable and dermophiiiic. Spandex & rubber yarns provide optimal compression and four-way stretch. Double layered knitting imparts strength and durability. 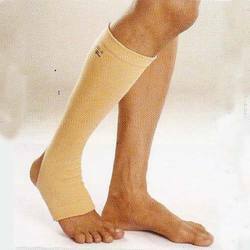 Tapered shape offers graded compression upwards from toe for effective blood evacuation. Open toe design is easy to wear, comfortable in hot weather and also reduces wear & tear. Nylon yarn makes it comfortable, durable and dermophiiiic. 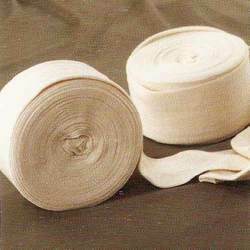 Spandex & rubber yarns provide optimal compression and four-way stretch. Double layered knitting imparts strength and durability. 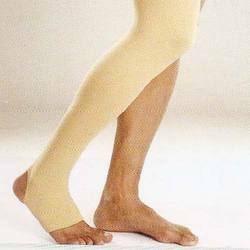 Tapered shape offers graded compression upwards from toe for effective blood evacuation. Open toe design is easy to wear, comfortable in hot weather and also reduces wear & tear. Anatomic design, maintains the natural low back curve & relieves the anterior pressure on the vertebras. Side supports hold the body and enhance comfort. High density of PU foam used offers high resilience, better cushioning and longer functional life of the product. Removable and washable cover gives plush looks to match, car or office interiors. Looking for Allied Products ?